"When they told me yesterday what had happened, I felt like the moon, the stars and all the planets had fallen on me"
A Web version of TWA 800 Google Earth simulations has been created by Bob Donaldson (twa800.com) that will show you the view and perspective of each of the eyewitnesses. The views show the altitude of Flight 800 from the perspective of each eyewitness. Flight 800 is indicated by a red dot connected to the horizon by a white line. The white line is simply used to show where Flight 800 is located above the horizon. You must have Google Earth loaded on your computer to use this link. http://earth.google.com/download-earth.html Be aware that Google Earth does not work well on slow old computers. To access the networked Google Earth link, do the following: 1. Open Google Earth. 2. At the top menu bar, click on the "Add" button, then click on "Network Link". 3. Enter TWA800 for the Link in the "Name" box and then paste the following link in the "Location" box: http://twa800.com/google-earth/flight-800.kmz 4. Click OK. The link will now load the latest version of the file. Click on the triangle next to the new link and it will expand all the links. To zoom to a location, double click on that link. When you zoom to a witness location, an information balloon comes up. Most balloons have a link to a jpg drawing of the missile trail the witness described. The "Meyer" missile fired from close to the shore (this missile may have been land launched) made a sharp turn to catch the aircraft and exploded near the left wing of the aircraft. The upper surface of the port wing was shattered by the shock wave which propagated through the fuel contained in the port wing fuel tanks. View photo unearthed by Ian Goddard and read the Report to the Subcommittee on Aviation on the Crash of TWA Flight 800. This is the missile described by eyewitness Meyer as moving from his right to left. Several of the eyewitnesses (see the Goss and Perry accounts for example) state that they saw this missile go up and make a sharp turn before exploding. Ian Goddard has documented the high velocity holes in the aircraft caused by this missile. "I saw a streak of light moving very rapidly from my left-center farther to my left. It was red-orange in color - it resembled the path of a shooting star that you would see at night. That's exactly what it looked like except it was red-orange in color and I saw it in broad daylight and one does not see shooting stars in broad daylight. There was a break - where it stopped - and then for an instant I saw nothing - and then suddenly right there I saw an explosion - high velocity explosion - military ordnance! - looked like flak in the sky - and I've seen a lot of flak. It was military ordnance!" The first missile, the one that went over the beach from North to South, exploded on the left side of the plane in front of the left wing. It didn't hit the plane. It exploded without hitting it, looking like a big bright white puff. Sort of like a light bulb glass shattering, bright white and brittle. There seemed to be just enough space in the sky between the explosion and the plane that I really thought the plane would be OK. The explosion was very close to the plane. I remember feeling relieved, that the plane would be alright because it hadn't hit the plane, when I suddenly saw the other one coming up under the plane. I'm sure that one hit it, as I almost expected to see a hole popped in the plane from it but I was surprised when it didn't appear out the top. At that point when I was expecting it to pop out, the plane stopped, and began the end (destruction sequence). She heard a great roar over her car at the intersection of the exit 62 northbound ramp of Sunrise highway with CR 111 (Manorville Rd. ) and then saw middle eastern looking men scurry out of the woods and board a red pickup and a blue Jaguar. If she heard missile #1, it could have been launched from a point several miles north of the beach, near Sunrise Highway. Another eyewitnesses reported the tail of the aircraft "flying" through the flash of the"Meyer" missile. Witness advised that he was traveling west on the Sunrise Highway in the vicinity of Center Moriches when he observed an airplane off to his left flying in an eastbound direction. Witness glanced to his left a second time and, on this location, observed a bright flash of white light on the rear portion of the airplane. Witness described the white flash as small, similar to a firework, circular in shape and of a size which did not obstruct the view of the airplane. Witness indicated that the airplane appeared to be flying through the white flash. A missile was fired from a boat at sea located to the north and ahead of the aircraft. This missile, observed by many eyewitnesses including Lisa Perry as mentioned above, was also observed by Meyer's co-pilot, Chris Baur, moving from his left to right. "A second and a half to two seconds later - farther to the left but down - I saw a flash once again - high velocity explosion - brilliant white light - like the old fashioned flashbulbs that we used to get one picture out of it and then it was gone - brilliant white light." The "Baur" missile came from the NE and impacted under the nose of the aircraft. This missile was the one that caused the damage to the nose wheel and forced the cockpit upwards. The explosion blew out the right hand side of the plane. The right inboard engine was fodded with debris from the forward fuselage. Debris from this missile was seen exiting the right hand side of the aircraft on radar returns. The right wing had holes punched in it's leading edge indicating travel of shrapnel transiting the wing. 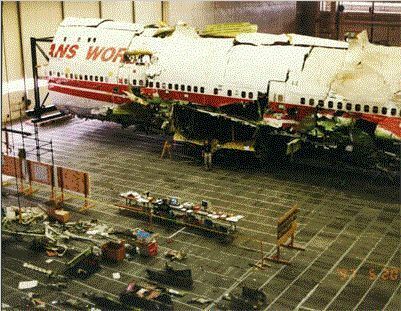 "Federal officials investigating the crash of TWA Flight 800 are baffled by the discovery of impact damage on the doors that close over the front landing gear. National Transportation Safety Board investigators have been trying to figure out what could have caused the nose gear doors to blow inward. Examiners are said to be mystified about the significance of the damage on the doors, which are located below the flight deck and well forward of the plane's center fuel tank. The investigators are equally troubled by the fact that these nose gear doors were among the first things on the plane to have come off in flight. One crash investigator told CNN on Friday that the discovery keeps open the question of whether the fuel tank explosion was the primary or secondary event in the in-flight breakup of TWA flight 800." Here is another witness who saw the "Baur" missile. He glanced over to the south east and served what he thought was a firework ascending into the sky. He stated he originally felt this firework emanated from the shoreline on the other side of the jetty to the east. Witness stated that he continued to watch the firework ascend, expecting to view the explosion in the sky. He stated this object which was ascending left a wispy white smoke trail. At this point he observed an airplane come into the field of view. He stated this airplane was very high up and many miles from his location. He stated that the bright red object ran into the airplane and upon doing so both the plane and the object turned a real bright red then exploded into a huge plume of flame. Witness noted that he felt that either the bright red object pushed the nose cone of the plane up or the plane was slightly angled upward when the strike occurred. He stated he felt the bright red object struck the plane towards the cockpit area. This plume separated into two sections which spiraled to the ground and left a white cloud of smoke in the sky. Witness stated that the flight of the bright red device took about 15 seconds. A missile was fired from a vessel traveling at 30 knots south of the aircraft's position. This missile was observed clearly by Dwight Brumley who was a passenger in an aircraft close to the TWA 800 explosions. The missile transited the aircraft from the starboard to the port side. The entrance point for the "Brumley" missile is directly below the fourth window to the right of the door and just in front of the right wing. The exit point is forward of the wing on the port side. Witness was on the Mobay section of Long Island Beach, New York. She noticed an aircraft climbing in the sky traveling from her right to her left. Witness noticed that the aircraft appeared to level off. Witness thought that the aircraft was too low of an altitude to be leveling off at the time. While keeping her eyes on the aircraft, witness observed a red streak moving up from the ground toward the aircraft at an approximate 45 degree angle. The red streak was leaving a light gray colored smoke trail. The red streak went past the right side and above the aircraft before arcing back toward the aircraft's right wing. At the instant the smoke trail ended at the aircraft's right wing, witness heard a loud sharp noise which sounded like a firecracker had just exploded at her feet. Witness then observed a fire at the aircraft followed by one or two secondary explosions which had a deeper sound. Witness observed the front of the aircraft separate from the back. William Gallagher: October 20, 1997 The Press-Enterprise, Riverside, CA. "I saw something hit the right side of the plane," said Gallagher. "My opinion was it blew the wing off on impact. I assumed something went through the airplane, like behind first class and into the wing." Gallagher, of New Jersey, has worked the ocean waters near the crash for more than 15 years. "My honest opinion, my gut feeling, is that we have the most brilliant people in the world and the best technology," Gallagher said. "If they've been on scene for a year and they've not come up with something, as a critical thinker I have to ask, could they be covering up something?" National Security was clearly involved in the downing of TWA 800. How else can one explain why the U.S. President would issue the following Executive Order if this incident was a simple air disaster? Navy assets and units that recovered the debris of TWA 800 included: USS Grasp (ARS 51) USS Grapple (ARS 53), USS Trenton (LPD 14) USS Oak Hill (LSD 51), Explosive Ordnance Disposal Unit 1 Explosive Ordnance Disposal Unit 2, Explosive Ordnance Disposal Unit 6 Mobile Diving and Salvage Unit 2. These assets and units are subsets of the Naval Special Warfare Development Group. E.O. 13039 removed all personnel in this Group from whistle-blower protections for reasons of "national security." In this website you will find evidence that supports the above triangulation of eyewitness testimony of the missile engagement of TWA 800: triangulation.gif (fast download) triangulation.pdf (slow download but can be zoomed to higher magnification using Acrobat Reader.) A video of eyewitnesses's observations of each missile, and audio files of eyewitness testimony, are available in the article On a Clear Day You Can See Forever. "A second and a half to two seconds after that (the second white explosion) - farther to the left but even lower - I saw either one or two nearly concentric detonations - da da (sic) - and from those detonations emanated this huge, slowly forming, low velocity explosion fireball." FBI Witness 261 saw all three missiles. The FBI conducted a major search for the remnants of the missile firings. The triangulated missile attack was similar in nature to an attack that failed in the same area three weeks prior to the downing of TWA 800. See The Tale of The Tapes for details of this attack and for details of other missile attacks in the NY Metropolitan area which were also unsuccessful. The fuel in TWA 800's tank could not have exploded until the fuel was misted by the break up of the aircraft by a prior initiating event. A lighted match can be extinguished in jet fuel as shown in this demonstration. http://twa800.com/videos/FuelDemo.rm Further, in this video http://twa800.com/videos/JetA_Cooker.rm you will see that there is no combustion until the fuel reaches 185 degrees. Then there is only a slow burn in which the vapor is consumed and the fire goes out. (Download of this video will take several minutes) The maximum fuel temperature at the altitude of the aircraft's destruction was 140 degrees. 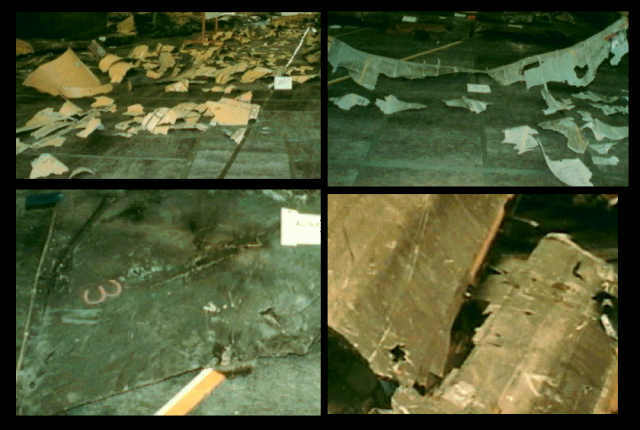 The NTSB searched for a phantom spark from low voltage wiring that ignited the Center Wing Tank fuel while failing to acknowledge that this same aircraft was struck twice by lightning on Good Friday, 1995 on approach to Rome airport. The right wing suffered significant metal damage requiring about 25 square feet of right wing tip skin to be replaced. The lightning traversed the #4 reserve tank, the #4 main tank, the #3 main tank and the Center Wing Tank. Lightning represents a multi-thousand fold stronger ignition spark than that which can be generated by any electrical source within the aircraft. The public is asked to believe that TWA 800 was downed by a low voltage spark from a source yet to be discovered, while two bolts of lightning passing through four fuel tanks including the Center Wing Tank could not achieve the same result and a lighted match would be extinguished if dipped into TWA 800's fuel. The U.S. Navy was conducting an exercise in which the two missiles fired from north of the aircraft's flight path were meant to intercept a "drone missile" launched from a position south of TWA 800's flight path. Unfortunately, TWA 800 had been delayed in its climb to cruising altitude and was struck by the drone missile and was destroyed by the two intercepting missiles. a) The simultaneous firing of three terrorist missiles in a triangulated attack on TWA 800 was a state-sponsored attack. The U.S. government was conducting an anti-terrorism operation knowing that missiles had been fired at commercial aircraft off the East Coast of the United States prior to the downing of TWA 800. It failed to prevent the attack. b) The U.S. government was conducting an anti-terrorism operation knowing that missiles had been fired at commercial aircraft off the East Coast of the United States prior to the downing of TWA 800. Two terrorist missiles fired from north of TWA 800's flight path were also travelling in the direction of a vessel sailing to the south of TWA 800's flight path. One missile was launched from this vessel in response to this perceived threat. (A very similar mistake was made by the USS Vincennes when it mistakenly shot down an Iranian airbus airliner over the Persian Gulf on July 3, 1988. I suggest the U.S. government knew that terrorist missile launches were occurring in the Long Island area prior to, and after, the TWA 800 incident and had tried unsuccessfully to prevent them. (A parallel incident occurred in 1998 when a two year intelligence monitoring operation of the group that bombed the African embassies failed to protect the attack - See this January 13, 2001 NY Times article for further details). James Kallstrom admitted in a telephone conversation with Reed Irvine of Accuracy in Media that there were U.S. Naval vessels under Flight 800 on a classified "maneuver". Was this "classified maneuver" an anti-terrorist operation? Circumstantial evidence shows that TWA 800 was brought down by the Osama bin Laden organization and the downing was one of a series of missile attacks in the NY metropolitan area from November 1995 through the summer of 1997. At the time of the TWA 800 downing Osama bin Laden had a "formal" agreement with the government of Iran to attack American and Israeli interests. A war with Iran in 1996 was not in the long term interest of the United States given that in the Iranian elections a government more inclined to open a dialog with the West was moving into power under Present Khatami. 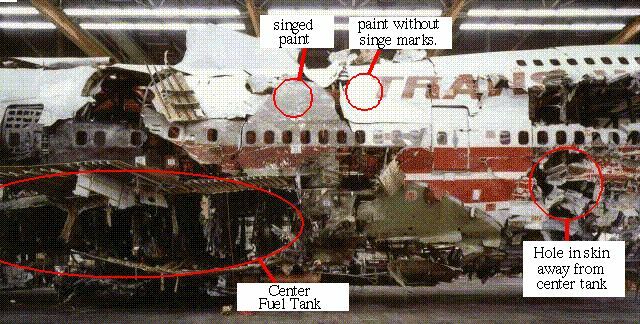 Thus in my opinion the United States government decided to declare that the center fuel tank of the TWA 800 aircraft exploded from an ignition source which is unknown and leave matters at that. Iran purchased American-built Stinger antiaircraft missiles in Afghanistan in 1994 and turned them over to a Lebanese-based terrorist organization, but the missiles proved to be defective, according to United States intelligence reports. Iranian agents then conducted further negotiations in Afghanistan for additional Stinger missiles, according to another intelligence report. It is not known whether the Iranians were able to buy any more of the advanced shoulder-fired weapons. The classified reports, which were provided to The New York Times, offer the first evidence that Iran had ever purchased the missiles, or that it had ever given them to terrorists who were considered willing to use them against American aircraft. For years, many American analysts have warned that terrorists might be able to get some of the missing Stinger missiles the Central Intelligence Agency supplied to Afghan rebels in the 1980's when they were fighting the Soviet Army. The fear has been that terrorists could then use the weapons against American or Israeli aircraft, perhaps including passenger planes. A United States official confirmed the reports today, but stressed that there was no evidence that the Stingers obtained by the Lebanese-based terrorist organization, the Islamic Jihad, actually worked. The documents report that in September 1994 an operative from the Islamic Jihad, an offshoot of Hezbollah, went to Tehran to receive the shipment of Stinger missiles, considered among the most dangerous weapons in the American arsenal. United States officials say the Islamic Jihad has conducted a series of terrorist operations against the United States and Israel since the 1980's, with the backing of Iran. The C.I.A. began supplying the Stingers to Afghan rebel groups fighting the Soviets in 1986, and the missiles played a crucial role in the outcome of the Afghan-Soviet war. After losing several aircraft, the Soviets were forced to curtail their use of air power, a shift that helped turn the tide of the battle. When the Soviet Army withdrew from Afghanistan in 1989, the United States ended its support for the Afghan rebels as well. But when the Americans left, many of the Stingers remained unaccounted for, left behind in the hands of warlords across Afghanistan. Ever since, the C.I.A. has had a secret program to recover the Stingers from Afghanistan, but in recent years American officials have estimated that as many as 200 have not been located. American Special Forces and C.I.A. officers operating in Afghanistan since Sept. 11 have tried to track down the missing weapons, but it is not known whether they have had any success. The missiles that the Iranians delivered to the Islamic Jihad operative had been purchased in July 1994 in Afghanistan by agents from the Iranian Revolutionary Guards Corps, a militant Iranian intelligence agency, according to one of the intelligence reports. Later, after the Iranians and Islamic Jihad discovered that the Stingers did not work, Iranian operatives contacted the representative of an Afghan warlord to try to open talks about buying others. But the Iranians were told that the United States had learned about the 1994 missile purchase, complicating any further negotiations, according to an intelligence report. According to one of the intelligence reports, Fuad Shukr, a Lebanese- based operative for the Islamic Jihad, traveled to Tehran in September 1994 to pick up the shipment of Stingers. At another point, according to the report, agents from Iran's Ministry of Intelligence and Security also tried to buy Stingers from the government that ruled Afghanistan before the Taliban came to power in 1996. That effort was apparently unsuccessful. It is unclear exactly what made the Stinger missiles defective or what happened to them once the problem was discovered, although there are indications, the intelligence reports say, that they were returned to the sellers. But in July 1996, according to the reports, operatives from the intelligence ministry approached an Afghan who represented Ahmed Shah Massoud, a leader of the Northern Alliance opposed to the Taliban. Although Mr. Massoud had not been involved in the 1994 sale, the Iranians asked if his organization could sell 6 to 10 Stingers, according to an intelligence report. But the Iranians were told that the United States had found out about the 1994 sale, thus making it difficult to hold any further sales negotiations. Mr. Massoud was killed on Sept. 9, two days before the attacks on the World Trade Center and the Pentagon, and American officials have said they believe he was murdered by Al Qaeda operatives sent by Osama bin Laden. The same policy appears to have been followed in another terrorist attack funded by Iran. The Clinton-Gore administration admits destroying 900 subpoenaed records needed to force Iran to compensate an American family whose daughter died in a terrorist attack. The victim's father is alleging the Justice Department got rid of its own files deliberately to avoid having to seize Iranian frozen assets to pay a $24 million judgment against Iran that the New Jersey family won in 1998. The administration is making an effort to placate the new government of Iran, which is on the State Department's list of terrorist states. The issue of Iranian financial assets frozen in the United States is key to Washington's hopes of resolving amicably its differences with Tehran. According to the World Tribune: Stephen Flatow's daughter, Alisa, was killed in 1995 in Gaza during an attack on an Israeli bus by the Islamic Jihad terrorist group under orders of Iran. He said his family had requested the 800 to 900 documents, related to licensing of U.S. transactions with Iran, as part of the family's effort to seize part of the Iranian frozen assets as compensation to satisfy the judgment. Flatow said a Justice Department attorney, Andrea Cohen, wrote to him that those files were destroyed due to lack of storage space. "We are beyond shock," Flatow said. "We are disgusted. And, if it turns out that the destruction was purposeful, I am going to see to it that heads roll at Treasury." Perhaps this is the correct policy to follow as events have revealed. Unfortunately in covering up the Iranian-sponsored attack on TWA 800 the NTSB has set a precedent that eyewitness testimony of criminal events is not to be believed. The NTSB was unable to understand the eyewitness testimony since it was excluded from this testimony by the FBI. More than 700 witness accounts of what happened the night that TWA Flight 800 crashed into the Atlantic Ocean, killing all 230 aboard, are too conflicting to lead to any conclusions, federal investigators say. Two new reports from the National Transportation Safety Board on Tuesday again dismissed theories -- all based solely on witness reports -- that the Boeing 747 may have been downed by a missile in July 1996. Investigators believe the crash was caused by a center fuel tank explosion possibly brought on by sparks from worn wiring, but their findings are still not complete. Of the 755 people who reported seeing the explosion, only 38 said they saw a streak of light rising straight up or nearly so -- and those accounts "seem to be inconsistent with the ... flight path" of the plane, the NTSB said. The NTSB, in its Witness Group Study report, said, "FBI witness interviewing was focused on the possibility that a missile had been used against the accident airplane. This focus may have resulted in bias on the part of some of the interviewers. "Beliefs concerning the possibility of a missile attack may have biased or colored the word choices used in reporting the witness accounts; therefore, these accounts must be interpreted carefully." A total of 258 witnesses observed a streak of light, the NTSB said. Investigators believe the streaks of light may have been from the plane during some stage of its flight before it exploded in a fireball. The NTSB witness reports conclude that the cause of the explosion cannot be determined through eyewitness accounts alone. Some witness accounts were too vague, some were too specific, and some contradictory, investigators said. The witnesses were on land, sea and air. Some were surfers. Many may have been influenced by news media reports about the explosion, investigators said. Most did not realize they were watching a plane explode, thinking rather that what they saw was some sort of fireworks display or other event.